It’s summer and tomatoes are at their juicy ripe best, so we thought we’d get out of the kitchen and go down to the local Greenmarket to show you all the different sorts you can find when they’re in season. Ann will show you heirlooms, beefsteaks, plum tomatoes and delicious little grape tomatoes. Look and learn! This Basic Quick Tomato Sauce is the sauce base Ann uses for nearly all her tomato pasta dishes. In the summer when local tomatoes are cheap and good, this is a great basic sauce to make for the freezer. It is also one of the fastest, easiest things you could ever make. It’s so quick, you can start the sauce at the same time you put the water on for pasta and be finished before the pasta has even finished cooking. Look and learn! Roasting tomatoes brings out all their natural sweetness. 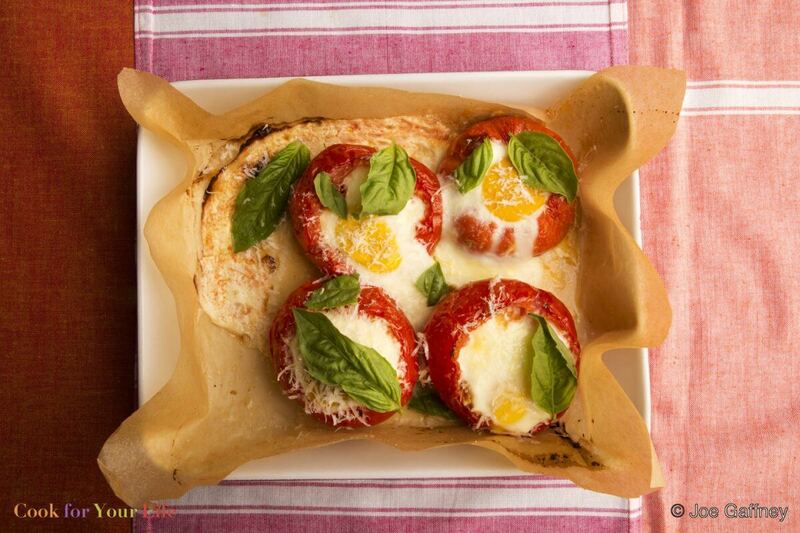 When beefsteak tomatoes are at their best, use them to make Eggs Baked in Tomatoes. It is an easy, delicious, spectacular looking breakfast or brunch dish. Better yet, this dish happens to be perfect for those on restricted, anti-microbial or neutropenic diets. No one could feel deprived for one minute eating this! This Easy Roasted Corn & Tomato Salad is a summery salad that’s easily made when the BBQ is fired up. It brings together three summer favorites: corn, tomatoes, and basil. The corn and tomatoes are simply broiled and roasted together on a sheet tray, which can be done ahead of time, or cooked directly on the grill. Then while still warm, Ann tosses them together with a simple dressing and some fresh basil. It is deeply tasty and simply excellent. Try ity! This Potato & Pepper Stew is a great way to use either green or red peppers and ripe beefsteak tomatoes. It makes a fragrant stew that is delicious hot or at room temperature. It freezes well too! The trick is to cook the onions and the peppers slowly until they are slightly caramelized and sweet. Serve it as a side with grilled chicken, or just eat it on it’s own with a chunk of good bread and a sharp green salad. For a different savory breakfast, break eggs on top of it and bake it in the oven until the eggs are set! Try it! Small seeds can be especially disruptive for people with certain gastric disorders, and this is certainly means tomato seeds. In this video Ann will show you a super easy no fuss method for deseeding tomatoes. Look and learn!